I just wanted to send a quick note to let you know what a terrific job Nathan and Iggy did in our home. The expertise Nathan displayed was the deciding factor in choosing your company to perform our desperately needed foundation repairs. 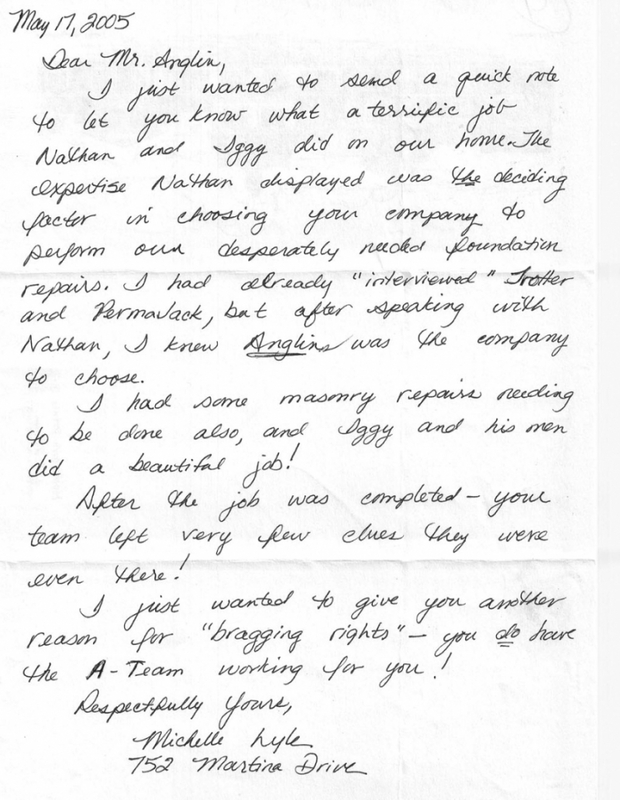 I had already “ interviewed Irotter and Permavack, but after speaking with Nathan I knew Anglins was the company to choose. I had some masonry repairs needing to be done also, and Iggy and his men did a beautiful job! After the job was completed – your team left very few clues they were even there! I just wanted to give you another reason for “ bragging rights” – you do have A-team working for you!